English non-league football is full of "gems" who could make the grade at the top level - but not enough clubs are brave enough to take a chance on them. Leicester striker Jamie Vardy, 28, is the Premier League's top scorer after rising to the top via non-league. And coaches down the football pyramid say there are more who could follow. "Jamie Vardy's not a one-off. But the talent is being missed," said Luton Town boss John Still. Still, 65, earned a reputation for spotting talent as he led three different clubs to promotion to the Football League. And speaking before Straight Outta Conference - a BBC Radio 5 live special programme looking at the journey from non-league to Premier League - he says while plenty of players are being picked up from non-league by professional clubs, a lot of talent is being ignored. "There's more out there that deserve a chance. It's people willing to take that chance," he added. Premier League player of the month for October Vardy arrived at Leicester after working his way up the leagues with Stocksbridge Park Steels, Halifax Town and Fleetwood Town. But this season he leads the Premier League scoring charts after scoring in nine successive games. He has already been capped four times by England and is expected to feature in the forthcoming friendlies against Spain and France. Steve Walsh, head of player recruitment at Leicester, said of Vardy: "He's such a confident lad he actually put in his contract when he joined Leicester for a bonus if he became an England player. 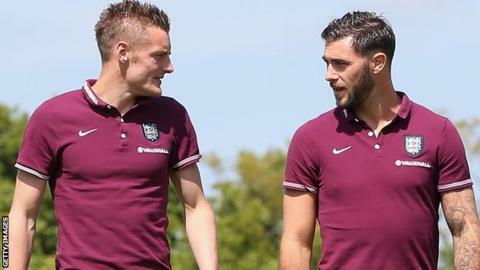 "Micky Mellon was his manager [at Fleetwood Town] at the time and he said Vardy could be anything he wants to be." His scoring achievements this season suggest so. And the characteristics which make him stand out, such as his tireless work-rate, have won him plaudits - with his manager even comparing him to Argentina great Gabriel Batistuta. But Still thinks there are more: "There's too many one-offs for him to be a one-off. He's made a great impact and he's headlining the show, but it's because he's a goal-scorer that Vardy's a bit more highlighted. "Look at people like Harry Arter at Bournemouth. He has worked his way up to the Premier League and he was at Woking. Another Bournemouth lad, Lee Tomlin, he also came through from Rushden & Diamonds. "Chris Smalling at Manchester United came through the same sort of path - because he's a defender he's not seen as quite as special, although he's playing for Manchester United and has a good few England caps." So there's more talent in non-league football? With 84 divisions across 58 leagues, the National League System is home to thousands of players. Some of them are potentially special, too, says Ian Concannon, joint boss of Didcot Town. The side from Southern League Division One South West - the eighth tier of English football - were the lowest-ranked side in the FA Cup first round. Despite a 3-0 exit at the hands of League Two Exeter City, Concannon says there are players at his club and division with the talent to go further in the game. "There's some good players. Our league is a tough league to get out of, better than people think. "There are gems out there. And if league clubs or decent non-league clubs want to get hold of young talent and nurture them then they only need to look down the leagues and see what there is." Players can help themselves to get noticed too. Brackley Town manager Kevin Wilkin saw his side draw 2-2 with Newport in the FA Cup to earn a replay and told the BBC: "This is the biggest window of opportunity for these lads. It gives them a chance to show what they are all about." "The whole attitude of players and clubs now has completely changed," adds Concannon. "It was very old school when I was playing. We'd turn up, we'd warm up, we'd have a game of football then have a beer in the bar. Now it's totally different. Players nowadays are really looking after themselves." "The rewards are certainly driving some of this," says Still. "If you become a Premier League player, the rewards now are staggering. "It's mind-blowing what you can achieve if you make it. If you play in the Premier League for five, six, seven years you don't have to worry about working again." Are clubs tapping into non-league football? "You just don't know who's watching games of football so it's important that the lads give everything they've got," says Concannon. And Aldershot boss Barry Smith, who saw his National League side earn a replay against League One Bradford City at the weekend, says scouts are a regular fixture at non-league games: "I don't know if the Premier League send scouts to our games but there are definitely scouts from League One, League Two. "There's definite interest in a few players we have got." Still, however, believes clubs higher up the pyramid are more focussed on players from abroad, or developing their own youths - Manchester City last year opened a new academy that cost £200m to develop. He also cited Tottenham spending the money they got from the sale of Gareth Bale on foreign talent - "and their best player is Harry Kane, who was on their doorstep". "The top-level Premier League clubs, they are probably more inclined to let a non-league player go to a League Two, League One or even Championship club first and then buy them," he adds. "But scouting networks have reduced in recent years. At the top level they have probably got a large recruitment staff but I'm not so sure if you come down the Football League. "The Football League clubs need to be braver. Getting someone from abroad for a lot of money is taking a chance. Spending £60,000 or £70,000 or £100,000 on someone isn't a chance, certainly for the big clubs. "I think scouts have to be brave enough to recommend them to the chief executive and the manager, and they have to be brave enough to give these people a chance." Vardy is being praised for his high work-rate, which many have put down to his non-league grounding. And Still says the experiences of non-league players make them more determined to make it in the professional ranks - if they have the talent to get there. He agrees with Concannon that amateurs are more driven than before: "There's no question that players are behaving more professionally now as you go down the leagues. Look at training regimes - they might not do it as often if they are part-time but the work they put in is no different. "The guy that goes to work all week and does training a couple of evenings a week, he's a dedicated person to do that. It's tough and it makes you tough. "Look at someone working on a building site who gets the opportunity to be a professional footballer. They will think 'well I don't want to go back to that' and they will do everything they can to make it. "The lad brought up since the age 12 who's been surrounded by it at a big club, I'm not so sure all of them will have that same hunger." Aldershot's Smith says as well as non-league experience equipping players with more hunger, it can help their development: "The academies are great for getting technical players but are they ready for men's football? "There has got to be a competitive edge. It matters if you are conceding goals as a defender." Still agrees: "Academy football is very, very good technically but the harsh reality is that you have got to be able to compete - to run, to challenge, tackle, have physicality about you. "And with the greatest respect, under-21 football doesn't achieve that. You have to teach them how to win as well. If they leave it too late to teach them to win, they can't adapt to the physicality and pace of first-team football." How do you spot a talent? Still's finds have included Crystal Palace forward Dwight Gayle - for Dagenham & Redbridge - and ex-Scotland international Craig Mackail-Smith - now reunited with the manager at Luton. But mining a gem from non-league takes hard work, he says. "Too many people are looking at DVDs, or using databases such as Wyscout than doing the hard miles. "There are players out there - but you have to get out there and watch them. They don't tell you the strengths and weaknesses the same as if you are there watching, in terms of movement, desire and so on." But the next Vardy may not leap instantly leap out at scouts who do go along. "It's easy to look at a Ronaldo or a Messi or a Neymar or Rooney and say 'they are a good player'," Still says. "You don't have to be a great judge to look at them and recognise that. "It's looking a bit deeper than that, looking for people that have the ingredients you can work on and develop, and saying to yourself, 'they have got something'."